The Jacobs Journal: The Circle Maker - GIVEAWAY! The Circle Maker - GIVEAWAY! The original "circle maker" was a guy named Honi who drew a circle in the sand during a drought, fell on his knees inside of it, and told God that he wouldn't move until God moved; until God ended the drought. "...the power of a single prayer to change the course of history." If you are a believer, if you have been saved by grace through faith in Jesus Christ, you are called to be an intercessor - a prayer warrior - a circle maker. 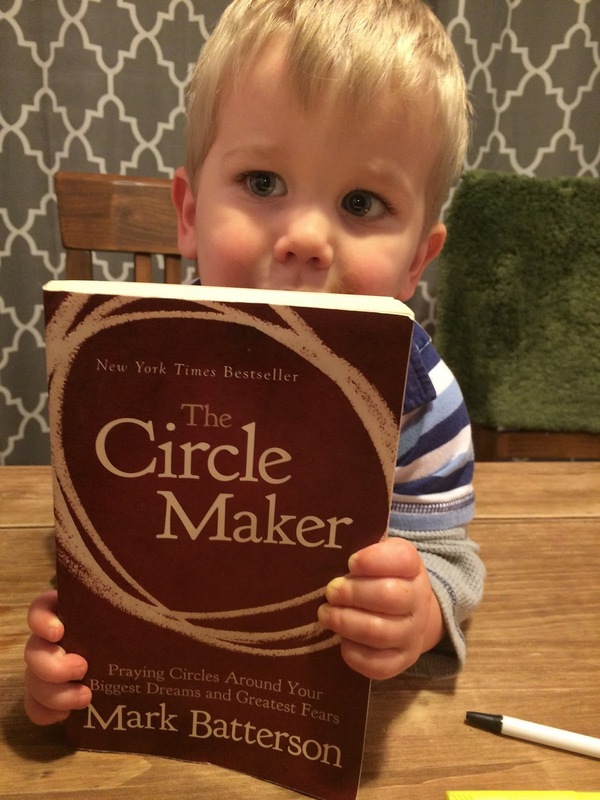 I have only recently began obeying this call on my life over the past couple of years and this book - The Circle Maker - has been instrumental in my growth in and understanding of prayer! I have said this before on social media and I will say it again: every Christian needs to read this book. I believe in God's call on your life and on mine to be prayer warriors, so much so that I'm giving away a copy of this book! There is only ONE entry necessary - share with me in the comments an answered prayer! It could be from last night, or from 20 years ago. Take a minute to reminisce on the times God answered your prayers (either how you hoped He would or otherwise!) and share one! One of the reasons we get frustrated in prayer is our ASAP approach. When our prayers aren't answered as quickly or easily as we would like, we get tired of circling. Maybe we need to change our prayer approach from as soon as possible to as long as it takes. Keep circling! That's what we are choosing to do. What prayer do you need to keep circling? Or return to circling? Or start circling? Remember that - "100 percent of the prayers I don't pray won't get answered." You are a Circle Maker. My husband's cousin has come to know the Lord this last month. He's 55 I think. That's a huge praise! Yay! God answered a health prayer request recently and in the past. The one in the past was that I discovered a lump in my left breast. Thankfully the Lord spared my life and it was not cancerous. The other act of God was just this past week when I had my kidney stones removed. I was an anxious mess, but God gave the peace that surpasseth all understanding. Yes! God has been increasing my prayer life lately, and one thing I'm learning is that sometimes "wait" IS the answer. For now. And sometimes, when the answer is "no", we are so discontent and assume God just hasn't heard. I'm slowly learning what to do when God says "wait", thought it's not easy. One thing, though, that God gave a nearly immediate answer on, and I'm being vague for a reason- I needed to talk to someone, but I was waiting on them. I prayed and asked a friend to pray, and no more then 10 minutes later, the person got in contact with me. It was humbling and exciting to see God move so quickly! Thanks for sharing, Angela! That's so exciting and encouraging! God continues to amaze me because a prayer He has been answering for me is to hear His voice and see the path laid out in certain areas of life with peace dwelling inside me. Another is healing for one of my nieces 😃😃. My daughter said she'd been praying for her aunt & cousin to attend church. Last night, my sister in law said that she was going to try a new church in the morning. Praise God! Praise the Lord! Thank you for sharing! Baby girl born healthy this week!